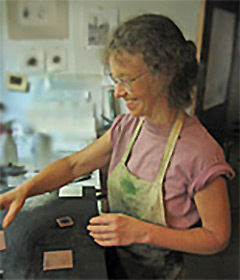 My prints are limited edition, hand-printed intaglios using line etching, aquatint, and soft ground techniques.They are usually begun by using the age-old methods of drawing with a needle through a thin wax ‘ground’ on a copper plate. The plate is then submerged in an etch solution which delicately corrodes the drawn line. Ink is rubbed into these etched lines, the surface wiped, and damp paper is pressed into the plate by the roller action of the press. Growing some of my food and studying the local wildlife are of great importance to me. My career effort has been to make a seamless connection between “money work” and the rest of my life.